Welcome to the June edition of the BANT ENews. In this month’s issue, our feature article provides an interesting overview on our genes and food habits. 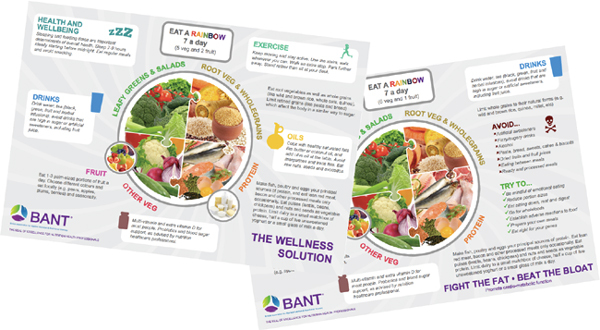 We introduce the BANT Nutrition Evidence Database and we publish results from a MSc dissertation study which BANT members contributed to.. Access the BANT news here. Welcome to the June edition of the BANT ENews. In this month’s issue, our feature article provides an interesting overview on our genes and food habits. We introduce the BANT Nutrition Evidence Database and we publish results from a MSc dissertation study which BANT members contributed to. This fortnight, an update from our volunteer, Sharon Peck, following the BANT Volunteer of the Year day held last week, we introduce Kal Ratcliffe, one of our new college reps, and a recipe for a smoothie breakfast from Nutri Advanced to power you through the end-of-year exams, for which we wish you all the best luck! On Friday this week was the first ever VOTY Day, which was held at a wonderful venue, The Willow in Kingston upon Thames. BANT plans for VOTY to become an annual event to help recognise and reward the army of volunteers behind the organisation, from directors to operations, including our own Student Network Team. Three of the team were able to make it to enjoy the day. The volunteer of the year, who the volunteers had voted for beforehand, was presented with an award that included a voucher for a Lifecode Gx test and other goodies. The Willow seeks to empower people to live better lives as a community space and a full-service ‘Food As Medicine’ styled restaurant. It serves ‘naturally enriching’ food, is 100% gluten-free and caters to many different eating plans from vegan through to low-carb and primal. It’s an inspiring place, which was very appropriate as initially we had an inspirational, motivational speaker, Amanda Brown from The Leading Ladies Company. Amanda led a interactive session during which time we had the opportunity to talk with other experienced nutritional therapists and hear their future aims and goals which was also inspirational. Lunch was amazing! We were treated to an extensive tasting menu which included salmon with seaweed tagliatelle, a rainbow salad made up of 5 different phytonutrient colours, sweet potato gnocchi and my favourite, a selection of raw vegan cheesecakes. I’d like to say a massive thank you to BANT and everyone involved in organising the day, that included a goodie bag for each volunteer. So, hopefully that’s inspired you to volunteer! If you’d like to, or want to find out more, current volunteering vacancies can be seen here. ‘For as long as I can remember, food has always been my passion. My interest in nutrition was first sparked when exploring the power of healthy eating and reproductive health for optimizing my chances of fertility. My personal experience of changing both my diet and lifestyle have shown me how it can have a significant influence on my health and wellbeing. It was this experience that convinced me to combine my love for food with a growing interest in its healing properties and undertake my Nutritional Therapy course. Having experienced corporate life and seeing the detrimental aspects of it, I then decided to build on my experience and undertake my studies to be able to share my learning. We would love more students to become College Reps. If you are keen, or want to find out a little more about what is involved, please email Catherine: tpl@bant.org.uk We are especially keen to hear from ION and CNELM students. Pre exam nerves can leave you feeling more nauseous than hungry, yet it’s crucial you have at least something for breakfast on exam day to provide a gentle energy release for your brain to access throughout the morning. If like many however, the thought of sitting down to a hearty breakfast is just too much to stomach, why not try this simple smoothie instead, packed with brain-boosting ingredients. Smoothies are a great pre-exam breakfast; because they’re blended, they’re easy to drink and easy to digest too, and usually tolerated by even the most anxious gut. Place all ingredients in a high-powered blender, blitz until smooth. You can add more milk if you prefer a runnier smoothie. Enjoy and good luck! BANT is excited to announce the launch of the Nutrition Evidence Database. Nutrition Evidence is a platform of high quality nutritional science and functional medicine research, designed to support nutrition practitioners’ clinical decisions that enable their delivering effective, individualised evidence-based recommendations. Almost 95,000 (as of June 2017) high quality research papers relevant to all practitioners in the areas of functional nutrition, dietetics, and lifestyle medicine. Papers have been selected to provide the best evidence available for clinical interventions on humans, ideally randomised controlled trials and systematic reviews, as well as meta-analyses and some cohort studies. BANT enhanced papers, further curated by the Nutrition Evidence Editorial Board and enriched by an indexing team of BANT members, based on the functional medicine model. These papers include plain language summaries, clinical imbalances and laboratory testing. These papers will appear first in any search results. The indexing process is ongoing and new papers will be added weekly. A wide selection of filters to allow you to find papers discussing key functional medicine factors and keywords. For example, you’ll be able to search for papers on environmental inputs or structural integrity. Account personalisation features (e.g. subscribe to notifications). An array of exciting new features, including expert reviews, paper recommendations by the Editorial board and more are just round the corner, so please register for a free account today. Visit http://www.nutrition-evidence.com/login and create an account (‘sign up’). This will create a personal account and enable you to access all features within the database. The database development is on-going so if you have any comments or questions, please contact emma.hendricks@bant.org.uk and watch out for the release of new features in the future.